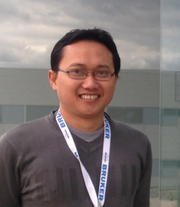 Yuniar Ponco Prananto (YPP) is a chemistry graduate from Brawijaya University (Indonesia, SSi) and Monash University (Australia, MSc). He is now a Senior Lecturer at Chemistry Department, Brawijaya University, Indonesia. At the moment, YPP is doing a PhD with Prof. Stuart R. Batten in School of Chemistry - Monash University, Australia. His research is close-related to Inorganic Chemistry, Coordination Polymers, and Supramolecular Chemistry. YPP had joined in some chemistry professional organisations, namely: • Member of Indonesian Chemical Society (HKI), since 2010 • Member of Royal Australian Chemical Institute (RACI), 2013-2017 • Member of New Zealand Institute of Chemistry (NZIC), 2017-2018 • Member of Society of Crystallographers in Australia and New Zealand (SCANZ), 2016-2018. SINTA ID: 257054; SCOPUS ID:26031721600.